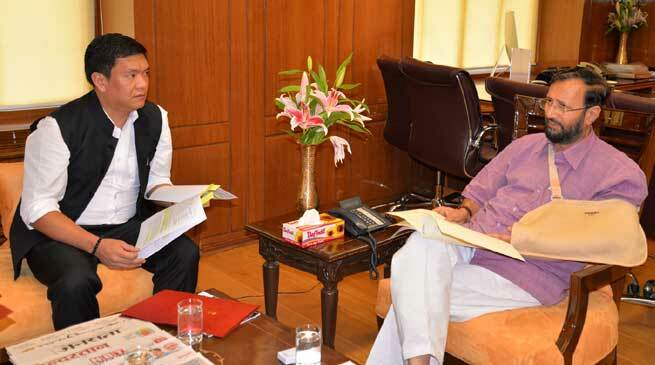 Chief Minister Pema Khandu has requested the Union Ministry of Human Resource Development (HRD) Prakash Javedekar to switch over the funding pattern of Model Degree Colleges to 90:10 ratio as per the Rashtriya Uchatar Shiksha Abhiyan (RUSA) programmes. Calling on Union HRD Minister Prakash Javedekar here this evening, Chief Minister requested for change in funding pattern as mandated under RUSA for the ongoing works of the six degree colleges. Union Minister directed his secretary to put up a cabinet note immediately to change the funding pattern for Model Degree Colleges. He assured Khandu that it will be taken up as mandated under RUSA guidelines in similar lines to other programmes. HRD Minister further agreed for establishment of Model Degree Colleges under RUSA as proposed by the state government against educationally backward blocks (EBB). Drawing attention of the Union Minister towards Rashtriya Madhyamik Shiksha Abhiyan (RMSA), Khandu reminded that the Union Government had accepted the state government’s proposal to enhance contractual teacher’s salary under RMSA at par with that of SSA. He requested to enhance the salary of Trained Graduate Teachers (TGTs) @ Rs. 26,453/- per month under RMSA and informed that the state government is ready to issue a notification in this regard. The HRD ministry agreed in principle. Highlighting the issue of salary release under SSA/KGBV, maintenance and stipend for the year 2015 -16 which has been pending with the Ministry, Javedekar directed the secretary concerns to address the issue promptly. He also assured to release first instalment of SSA soon. Chief Minister also requested for removal of No Detention Policy under new examination system mandated in tune to Comprehensive and Continuous Evolution (CCE) under RTE Act 2009. Minister clearly indicated that the matter has already been taken up for decision and hinted that state would be at their own liberty. Javedekar while assuring all out support to the state to improve education scenario, said “development is possible only through education”. He categorically advised the state government to facilitate the teachers to achieve the national goal of education. State should draw a special policy drive to recruit the subject teachers like maths, science and language so that it can contain the growing shortages being created year by year. CM was accompanied by State Government’s Principal Secretary Jitendra Narayan Singh during the call on.